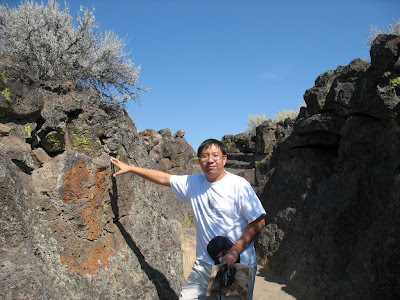 Our trip to Lava Beds National Monument (NM) took place the following day after our trip to Crater Lake NP. Lava Beds NM encompasses an area the includes the numerous lava flows emanating from Lake Medicine Volcano, a shield volcano which is probably the largest mountain in the Cascades Range in terms of area. The shield volcano's lava was highly fluid, and there were many different vents instead of just a single one. 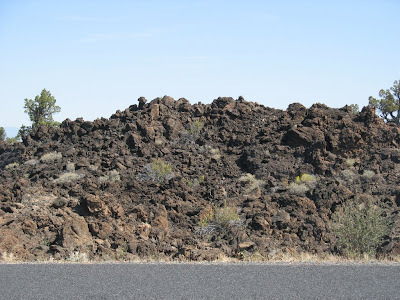 Therefore, the Lava Beds area is a textbook of various different volcanic formations, including cinder cones, spatter cones, craters, lava tube caves, and of course other lava flows. 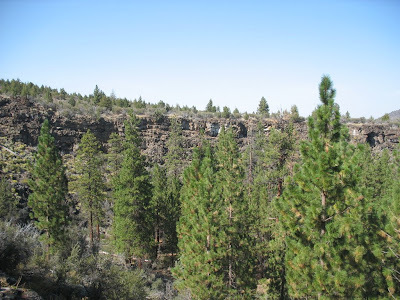 Lava Beds NM is located in the northern most part of California, near the state line. We stayed at Klamath Falls, OR the night before, and thus took OR-39 South. After crossing the state line, it turns into CA-139, and then there were many signs pointing us into the park. Coming from the northern entrance, at the first three-way junction, there is a sign to Captain Jacks Stronghold, which you would reach by making a left. 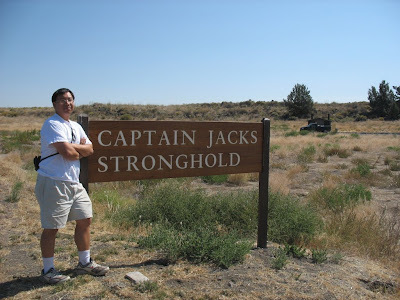 Captain Jack was one of the main participants of the so called Modoc War during 1872-1873. Conflicts between the Modoc Native Americans and the settlers have already ended in many deaths. The official chief of the Modoc, Old Schonchin, then signed a treaty with the United States, Klamath tribe, and Yahooskin tribe. Under the treaty, the Modocs would move to a reservation and share the land with the other two tribes. However, the Klamath Indians were long rivals of the Modocs, and while many tried to adapt to new life, many did not put up with it. Captain Jack led around 150 men and women and returned to their home Lost River to pick up their old ways of life. Initial negotiations with the United States government only made things worse, ending in more deaths on each side. Captain Jack and his people retreated to Lava Beds, where they fortified themselves at today's stronghold. Familiar with the area and its geography, the Modocs held off the United State army for 6 months. Out of the 150 men, only about 50 were actual warriors. They managed to take on an army whose size eventually grew to 1000 people, and they inflicted 73 casualties and another 47 wounded. During the war, only 13 Modocs were killed. Eventually, Captain Jack's men started to lose faith in him and a group who deserted him also managed to help the US army capture him. Captain Jack and three others were tried and hanged for killing 2 members of a Peace Commission. The remaining Modocs were sent as prisoners of war to Oklahoma. 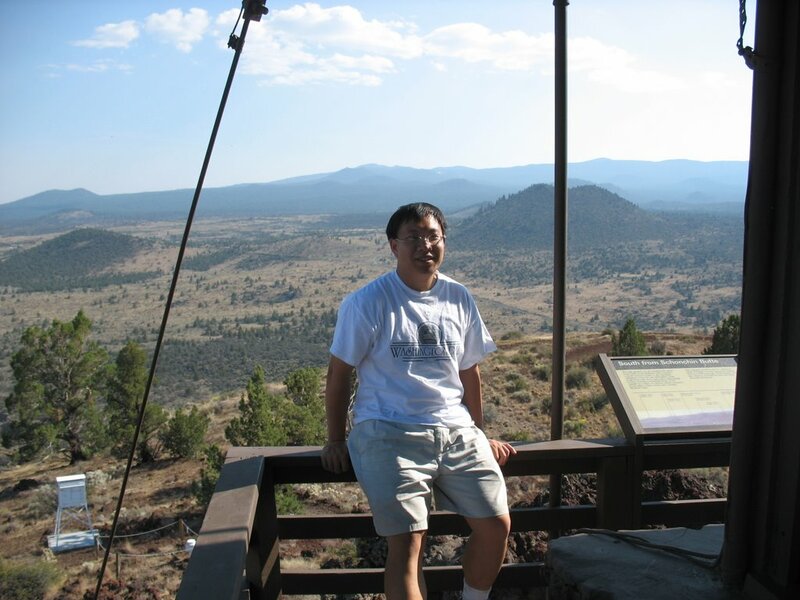 Today descendants of the Modocs can be found in both the Oregon Klamath area and the Territory of Oklahoma. The Modoc War was an expensive war for the United States, costing them more than $400,000, more than $350,000 of the original estimate. Considering that there were only 50 or so Modoc warriors, this was an extremely inefficient use of resources. There is s small parking lot at Captain Jacks Stronghold. There are two trails that circle the area, a shorter one of 0.5 miles and a longer one of 1.5 miles. 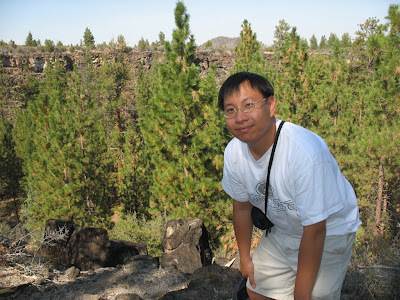 Because the basalt rocks are hard and irregularly shaped, some parts are not very nice walks. Remember to wear comfortable walking shoes. Some of these rocks are taller than the average human being, and the whole place is like a maze. It is not hard to imagine what a nightmare it must have been for the ill-prepared U.S. army who tried to attack the place. Along the trail are signs that mark the events of the war or other hideout location of Captain Jack's men. Although the Modocs successfully repelled many times an army many times their size, their living conditions during those few months must have been just as miserable. One must admire their strong will and determination (while it lasted). Coming from the north, before you reach the visitor center, you will pass through the Devils Homestead Flow. Since the road literally cuts through the area, it is a geological feature you cannot miss, for it is on both sides of the road. Basalt rock and soil is normally bad for vegetation because of its chemical composition. This is evidenced by the scarcity of trees and grass in the area. This area owes its name to the dark color and barrenness, which is quite descriptive and appropriate. Staying on the main park road, you will reach the visitor center, and next to it, the Cave Loop Road. These caves are called lava tube caves, where the main shaping force is molten lava. 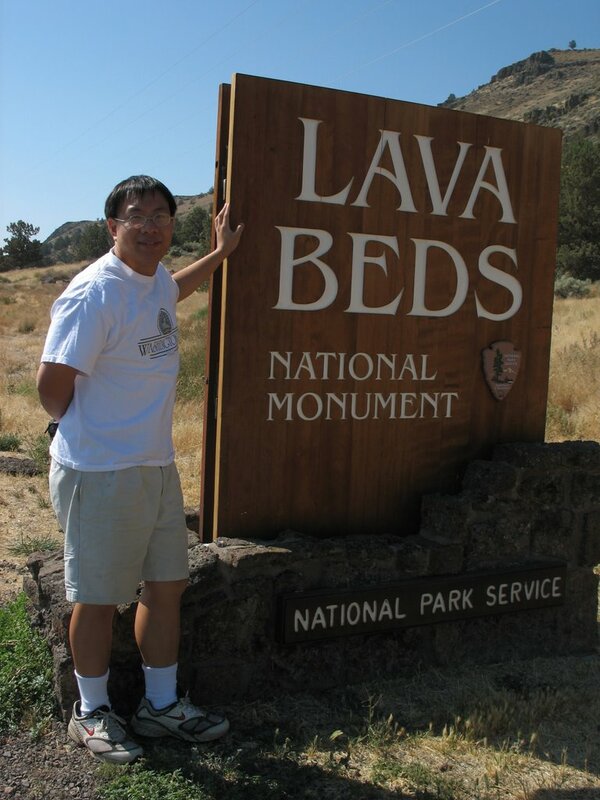 A lava tube is formed when the outer edges of flowing lava hardens into rock, forming a conduit that insulates the lava flowing inside. When the lava flow dries out, it hollows out into a cave. Lava Beds NM contains the highest concentration of lava tubes in the United States. There are more than a dozen caves in the Cave Loop, and this place is ideal for the family wishing to do cave exploring adventures with their kids. The caves come in all sizes and shapes, which means some are narrower while some are wider, some are steeper while some are more gradual, and some are longer while some are shorter. You just need to know what to expect and know your limits. Some of the narrower caves involve duck-walking or even crawling on all fours. With the exception of Mushpot Cave, there is no external lighting in the caves. A few meters inside the cave, and it quickly turns pitch black. Therefore, you must be equipped with a flashlight before entering any other cave. If you do not have your own, the visitor center rents out flashlights for free by depositing an official I.D. 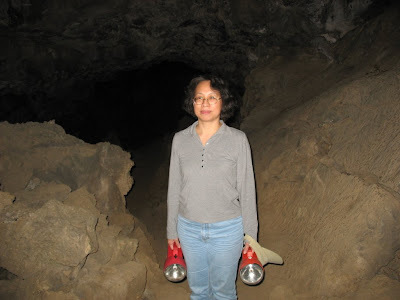 Being with my mom, I decided to pick one of the easiest caves. I seem to have forgotten exactly which cave it was that we went into, and I also don't quite remember why I decided not to go to Mushpot Cave. Either it was closed or I just wanted the "primitive" experience of going inside a cave. As stated earlier, these basalt rocks are hard, which means parts of the floor are not easy to walk on. Walk with some caution, since a sprained ankle would be totally uncool. Speaking of cool, it gets really cold inside the caves, and certain caves even have ice deposits all-year-round. Remember to bring long sleeves and other forms of warm clothing when entering. The main source of lava that created the caves in the National Monument, Mammoth Crater is located roughly 5 miles southwest of the Cave Loop Drive. Unlike most explosive craters, the fluid basalt lava simply overflowed out of here, creating unbroken lava tubes extending up to 10 miles from here. The road to Mammoth Crater is unpaved and bumpy. 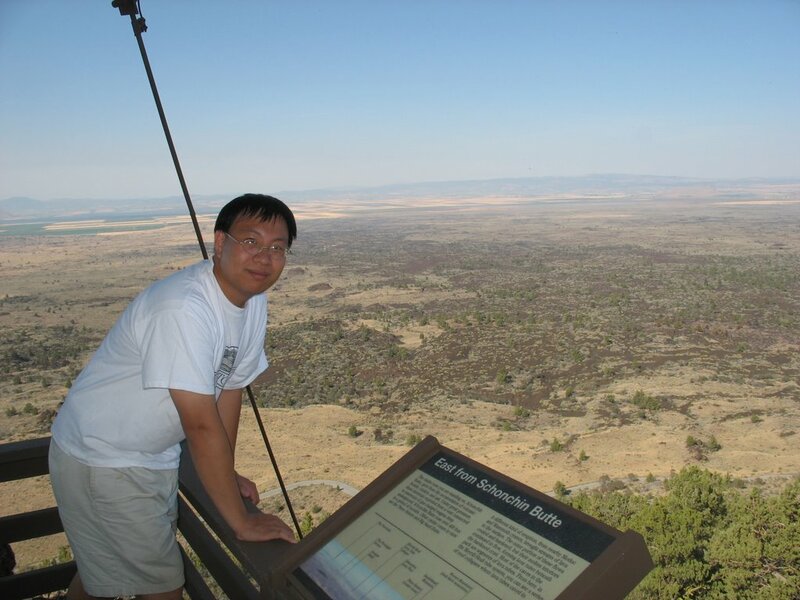 We did not hike around the rim of the crater either. For all that we went through, it was a minor waste of our time. These two pictures taken here are that of the Hidden Valley, which is just next to the crater. I suppose it is "hidden" in the sense that the valley floor is now filled with Ponderosa pines, and if you don't look closely, you might not realize the large cavity. The pine forest also provides a nice shade, given that it was scorching hot at the visitor center. 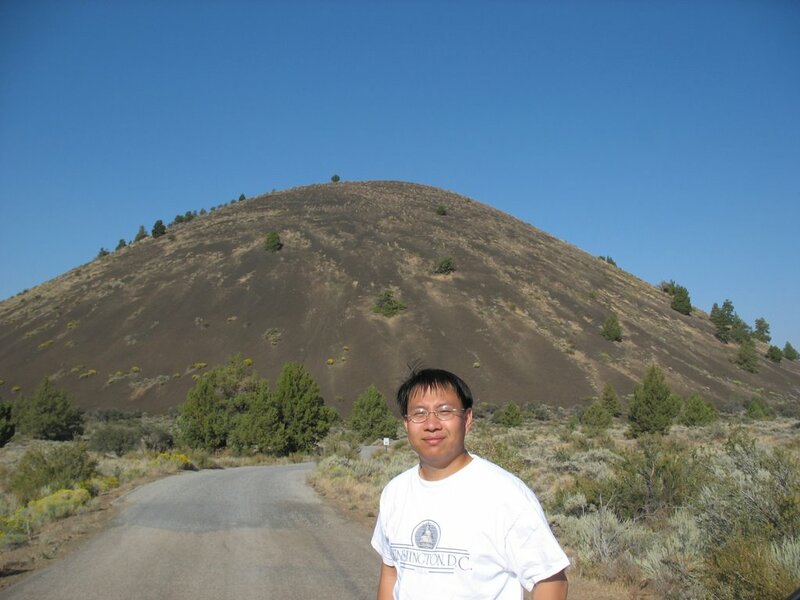 Schonchin Butte is a cinder cone and one of the most recognized features in the park. 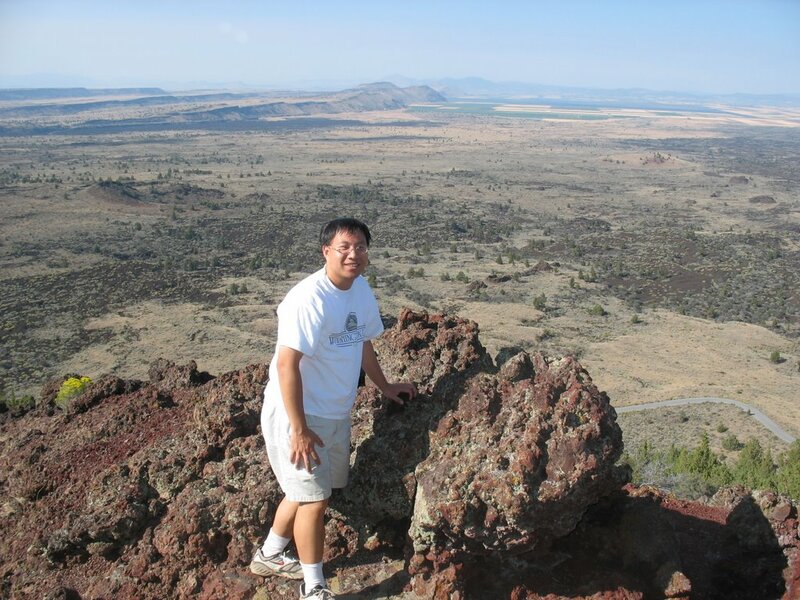 It is also the closest most accessible hill to hike in the park. Exiting the visitor center and driving north, it will be on your right hand side. Look for the sign to turn into. Schonchin Butte is a relatively easy hike, and there is a Fire Lookout at the top of the hill. A ranger is stationed here during the day to see if there are any fires burning in the area. For what little vegetation is there, any fire could be potentially devastating. The ranger I met this day said that she would pack her breakfast and lunch and a good book to read to make her get through her day. For the usual visitor though, standing on top of Schonchin Butte provides fantastic views of the Lava Beds area. 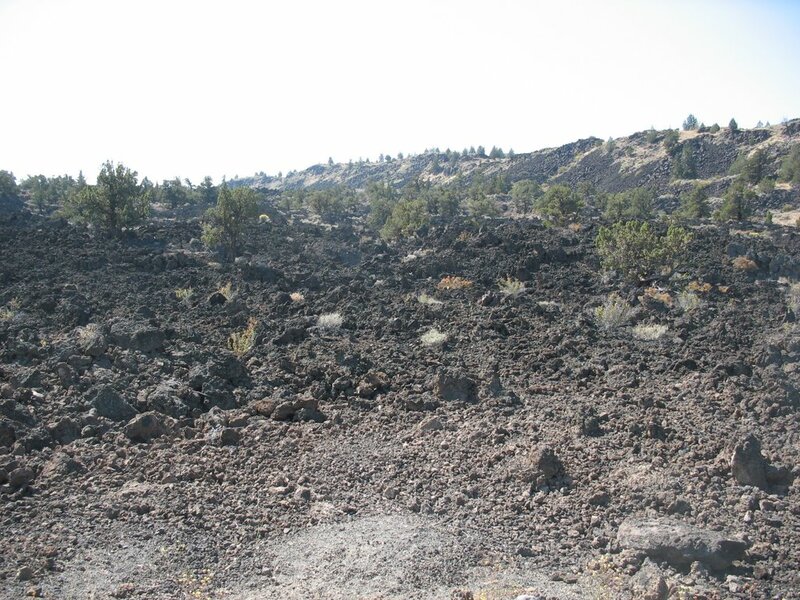 The contrasting colors in the rocks and soil draw out the lava flow trails. Compared to Crater Lake the day before, it was definitely several levels lower in terms of beauty, if any. Both being sculpted by volcanic activities, the different type of volcanic formations have created drastically different geological wonders. 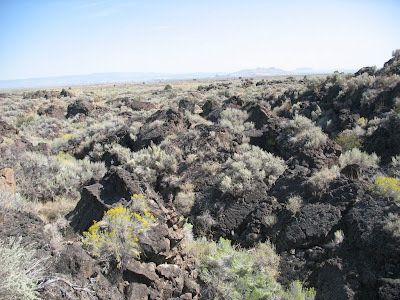 Despite lacking the natural beauty that other parks have been able to provide, Lava Beds NM's interesting volcanic formations have nonetheless left a lasting impression on me. The main source of the area, Medicine Lake, was even miles south of the monument, which involves more unpaved roads. It was not something we wanted to do, and we headed back to Oregon. Two years later, because of time constraints, a revisiting of the monument was much more rushed than this time, although I had the opportunity to explore many other caves.